3-CD in luxurious 8-page Digipac with 128-page booklet, playing time: 3h 50min. Songwriters aren't a thing of the past. Even if the song, especially the political song, has often been declared dead in Germany. But just a glance at the monthly 'Liederbestenliste' shows how colourful and lively the scene of musicians in this country who sing 'German' is: Songs with critical, thought-provoking lyrics and music that does not necessarily follow established listening habits. This can be in many styles: classical chanson, folk, pop, blues, rock, jazz or rap. They are all part of a long tradition that could be traced back to the troubadours of the Middle Ages. The collection 'Für wen ich singe - Liedermacher in Deutschland' does not go back that far, of course. For the first time, the project, which consists of 12 CDs, offers an overview of the recent history of songwriters in western and eastern Germany from the early sixties to the eighties of the last century. First of all it is about the rediscovery of the German song traditions. It was Hein &, Oss Kröher and Peter Rohland who had been working on the democratic song long before the new folk song movement, among others in the Bündische Jugend. In the early sixties, inspired mainly by artists in France or the USA, the voices that sought their own forms of expression included many names known today such as Franz Josef Degenhardt, Reinhard Mey, Walter Mossmann, Christof Stählin, Dieter Süverkrüp and Hannes Wader. 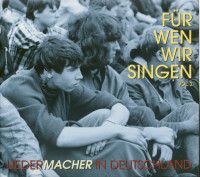 A first important forum for her and many other performers of a new German song were the festivals at Burg Waldeck between 1964 and 1969. A little later the German folk revival was heralded, among others with Fiedel Michel, Liederjan and Zupfgeigenhansel. They did not want to cultivate the folk song as a museum tradition, but to create a new type of democratic song. The seventies brought politically highly moved times. Singer-songwriters commented on emergency laws, bans on employment, unemployment, Vietnam war, nuclear arms and nuclear power plants. Alongside many artists from the Waldeck era, new names established themselves in the political arena in this way - including the song cabaret Floh de Cologne, Ekkes Frank or Lerryn alias Dieter Dehm. The Folkrevival also led to a broad preoccupation with dialects. Many songwriters rediscovered the dialects of their home regions as buried traditions. So in Bavaria the Biermösl Blosn. In Stuttgart, Wolle Kriwanek sang the Swabian blues. On the Lower Rhine Günter Gall made a name for himself in language and song care, in the Low German region it was Hannes Wader and Helmut Debus and in the 'Kohlenpott' Frank Baier. Not to forget the many other songwriters and poets who shaped the scene between the mid-seventies and the early eighties like Bernies Autobahn Band, Ina Deter, Joana or Konstantin Wecker. Then there's the song and chanson in the GDR - taken seriously and promoted, but as critical songs they are accustomed to bear and suppressed as oppositional ones. Artists like Hanns Eisler, Ernst Busch and Gisela May continued the tradition of political songs and chansons from the twenties and thirties. Wolf Biermann followed this up in the early sixties, became a critic of bureaucratic socialism and was banned from appearing and publishing. At the same time, so-called Hootenanny clubs were formed in which Perry Friedman, Hartmut König, Bettina Wegner and others performed. Under increased state influence, the FDJ singing movement developed, with at times 4,000 clubs, including the Oktoberklub and the TU Dresden song group. In the mid-seventies, song theatres such as Karl's grandson and Schicht and folklore groups such as Folkländer and Wacholder were created in contrast to singing clubs. In the 1980s Gerhard Gundermann, Stephan Krawczyk, Hans-Eckardt Wenzel and other songwriters articulated the difference between proclaimed ideology and reality and thus contributed to the critical discourse in the GDR. Not to forget the song scene of our German-speaking neighbours. Among them from Austria are Wolfgang Ambros, Arik Brauer, Georg Danzer, Ludwig Hirsch and the butterflies. From Switzerland it is Aernschd Born, Franz Hohler, Walther Lietha, Toni Vescoli and Tinu Heiniger, among others, who played an important role in those years. One or the other will surely ask, why is 'Soundso' not represented? Or why was the title 'X' and not the title 'Y' selected by this or that artist? This collection is a retrospective snapshot. It can't be all-encompassing. This also applies to the documented information, which makes no claim to biographical or discographical completeness. It is also true for them that they are excerpts that illuminate a certain moment in history. With the immense abundance of historical material, the choice was not easy. In the end, of course, there was a subjective decision. However, this was influenced by my understanding of singer-songwriters as artists who want to communicate something to their fellow human beings and make them think. Against this background, the political song cannot be separated from an allegedly apolitical song. "Unpolitical songs don't exist at all," Franz Josef Degenhardt said in 1967. 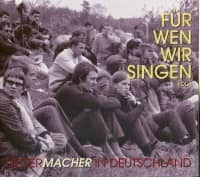 Holger Böning writes in his book 'Der Traum von einer Sache - Aufstieg und Fall der Utopien im politischen Lied der Bundesrepublik und der DDR': "The song is a very unique art form. Its effect does not only depend on the text, yes, often the text is only half the story, because through setting to music and lecture the poem gains a new quality." Böning speaks of the "power of sounds", which turn a song into a "means of finding political identity". And he continues: "Even where the text appeals primarily to the mind, the statement of warmth and emotionality often only gains through setting to music and can thus unfold a persuasiveness and effect peculiar only to the song form". As far as the content of such songs is concerned, Böning says: "Songs serve to portray one's own life situation or social and societal criticism; they can be news carriers, information media and means of agitation, but they are often also used to differentiate and establish the identity of groups or to heat up aggressive emotions against outsiders. When judging a song, I let myself be guided by the song philosophy of a man who is very close to me: Woody Guthrie. He put it like this in the mid-forties: "I hate songs that make you understand that you are worth nothing. I hate songs that make you understand you're born to lose. To lose for sure. Not worth anything to anyone. It's about singing songs that prove to you that this is your world, and even if it hit you damn hard and you got a dozen blows, no matter how much it pulled you down or rolled over you, no matter what skin color you have, how big you are, how built you are. I'm all about singing the songs that make you proud of yourself and your work." I would like to thank all the musicians who have contributed with their information and memories to making this little piece of sounding German cultural history a reality. My special thanks go to Nikolaus Gatter and Stephan Rögner, who helped me with the selection of the songs. 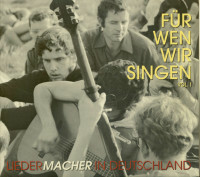 "Various - Liedermacher in Deutschland"
The song, especially the political song, has often been declared dead in Germany. But just a look at the monthly list of best songs - a hit parade of a special kind - shows how colourful and lively the scene of musicians singing'German' is in this country: Songs with critical, thought-provoking lyrics and music that is not necessarily based on established listening habits. This can go into many styles: classical chanson, folk, pop, blues, rock, jazz or rap. They all have a long tradition that can be traced back to the troubadours in the Middle Ages. The collection'Für wen ich singe - Liedermacher in Deutschland' does not go that far back in time, however. The project, which is based on four 3-CD sets, offers for the first time an overview of the recent history of songwriters in Germany-West and Germany-East from the early sixties to the eighties of the last century. 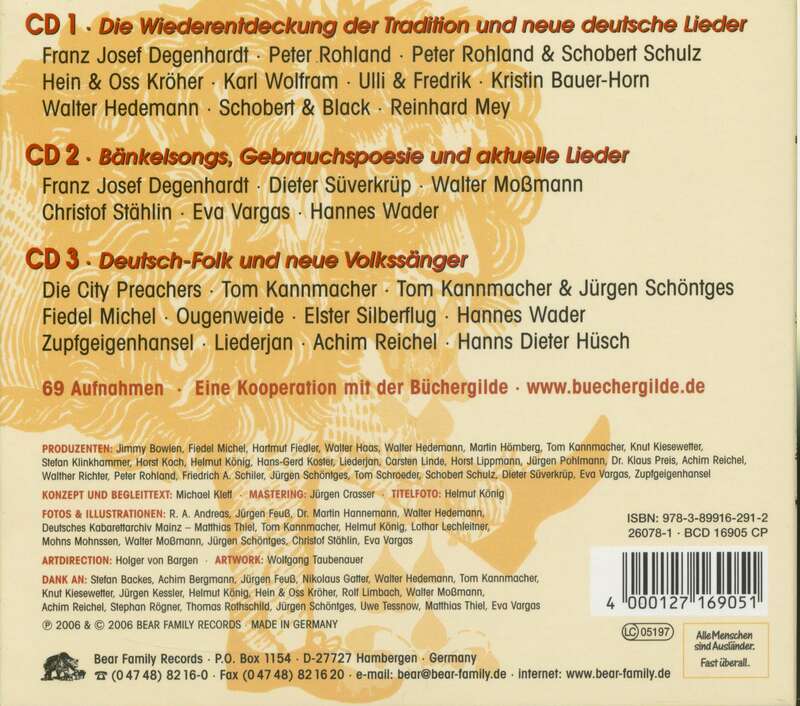 The first 3-CD set is about rediscovering tradition, about bank songs, utility poetry and current songs as well as German folk and new folk singers in the old Federal Republic. Hein & Oss Kröher and Peter Rohland had been striving for the democratic song long before the new folk song movement, among others in the Bündische Jugend. Among the voices who sought their own forms of expression against the background of their role models in France or the USA in the early sixties were many well-known names such as Franz Josef Degenhardt, Reinhard Mey, Walter Mossmann, Christof Stählin, Dieter Süverkrüp and Hannes Wader. Between 1964 and 1969, the festivals at Burg Waldeck formed an important forum for her and many other performers, including Kristin Bauer-Horn, Walter Hedemann, Schobert & Black and Eva Vargas. The German Folkrevival was started in the early to mid-seventies with Tom Kannmacher, Fiedel Michel, Elster Silberflug, Liederjan and Zupfgeigenhansel, among others. They did not want to cultivate the folk song as a museum tradition, but rather to create a new democratic type of song. Ougenweide brought a new musical colour to the spectrum of new German folk singers by mixing pop and rock musical instruments with old instruments such as the crumhorn and hurdy-gurdy. Achim Reichel was one of the first rock musicians to set classical German poets to music. The themes of the other sets are the songs of the politically turbulent times of the seventies. They comment on emergency laws, professional bans, unemployment, Vietnam War, nuclear armament and nuclear power plants. In addition to many artists from the Waldeck era, new names have established themselves directly in daily political life - among them Dietrich Kittner, the song cabaret Floh de Cologne, Ekkes Frank or Lerryn alias Dieter Dehm. The folkrevival also brought with it a broad occupation with dialects. Many songwriters rediscovered the dialects of their home region as a buried tradition. So in Bavaria the Biermösl Blosn. In Stuttgart, Wolle Kriwanek sang the Swabian blues. In the Lower Rhine region Günter Gall earned his living in various formations (Mulwerk, Fukkepott, Düvelskermes) for language and song care, in the Flat German region Hannes Wader and Helmut Debus and in the'Kohlenpott' Frank Baier. Not to forget the other names that shaped the scene between the mid-1970s and early 1980s, such as Bernies Autobahn Band, Ina Deter, Joana and Konstantin Wecker. Then there are songs and chanson in the GDR - taken seriously and promoted, but suspected as critical songs and suppressed as oppositional ones. Artists like Hanns Eisler, Ernst Busch and Gisela May continued the tradition of political song and chanson from the 1920s and 1930s. Wolf Biermann followed this up in the early sixties, became a critic of bureaucratic socialism and was banned from appearing and publishing. At the same time, so-called Hootenanny clubs were founded in which Perry Friedman, Hartmut König, Bettina Wegner and others performed. Under increased state influence, the FDJ singing movement developed from this with at times 4,000 clubs, including the Oktoberklub and the Songgruppe of the TU Dresden. In the mid-seventies, song theatres such as Karl's grandson and Schicht and folklore groups such as Folkländer and Wacholder were created in contrast to the singing clubs. In the 1980s Gerhard Gundermann, Stephan Krawczyk, Hans-Eckardt Wenzel and other songwriters articulated the difference between proclaimed ideology and reality and thus contributed to the critical discourse in the GDR. 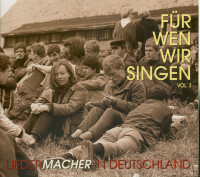 Customer evaluation for "Für wen wir singen - Liedermacher, Vol.1 (3-CD)"